Forty dates have been announced starting on June 12 in Evansville, IN and running through a two night stand in Woodinville, WA on August 25 and 26. Miller said "2017 was an amazingly beautiful, creative and rewarding music experience for our band and our audience. The band and production crew are working on creating an even better concert experience for 2018 and plan on wading even deeper into the musical waters. Peter Frampton and I enjoyed last summer. There is so much to explore and we are looking forward to seeing our friends in Canada and the States soon." This is also the 50th anniversary of the Steve Miller Band so expect some special moments during the show. "Music is ethereal it moves back and forth between the past and the future. 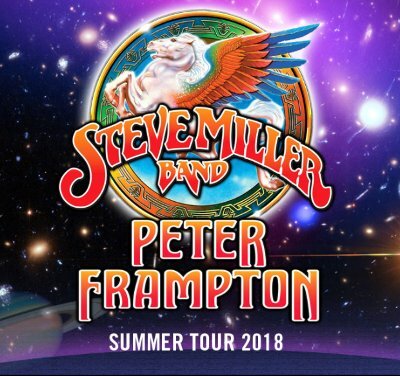 I'm very excited to announce that 2018 is our 50th anniversary of recording and touring together as the Steve Miller Band and we plan to travel between the psychedelic sixties through the future with a vengeance!" Frampton added "Having had such a fantastic tour together last Summer, Steve and I decided to keep going this year! Jamming together each night during Steve’s set is one of my favorite moments of the evening. Can’t wait to get back out there. See you soon."